Got a quote for a 2018 MDX SH-AWD with technology package for $52,223 out the door price. The MSRP is $51,575 with $3,500 off MSRP. Is this a good deal or should I be trying for a better deal?? Going to meet with them again this weekend. I bought a new 2018 Tech AWD two weeks ago in the suburbs of Chicago for around $47,600 or thereabouts before taxes, title, etc. Invoice is $48,484. Don't quote me, but I read somewhere recently there was $750 factory to dealer cash floating around on the 2018s, which would explain my less than invoice quote/agreed upon price. Not a bad price you've been quoted, but I think you can do slightly better if you feel like haggling a bit more. 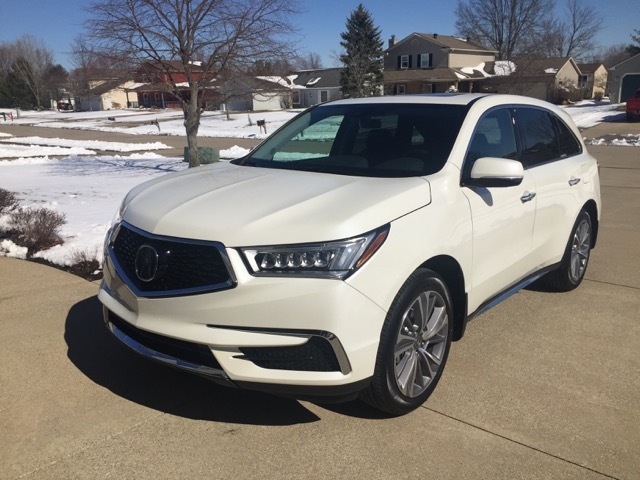 Wife and I just bought a 2018 MDX white/black SH-AWD Tech for $47,250 agreed selling price in North East Ohio. They threw in the already installed splash guards (so consider that another $100 off). That $47,250 amount does not include tax, title, finance charges, nor down payment, just the selling price. MDX4Now is correct about the $750 incentive from Acura at least that is what I saw when showed the papers for this from Acura Corporate. I also understand that, that amount runs through the end of the month at least. Good luck in your purchase!